The Theologyof Banning part 2 | "Northern Crossings"
Chemical weapons are banned by International agreement. 100% of chemical weapons we were told, were out of Syria thanks to the wonderful negotiation abilities of the previous administration. The banned weapons were used last week. Now the missiles flew again and of course this morning the questions fly about the flying of the missiles. Deterrence and targeted strikes are discussion points and of course the wonderful little statement about “proportional responses”. I have never understood that statement when it comes to Governments and their need to protect their people. In my darker moments I think responses should be out of all proportion when innocent people are attacked and killed or taken hostage or poisoned by whoever. When Iran took our people hostages and held them all that time all we heard was proportional response. I remember thinking that if they take someone hostage , we blow up an oilfield. If they kill a hostage we send their entire navy to the bottom of the sea. Responses out of all proportion seem to get attention and might be beneficial in the long run. Of course I am talking here about those in authority who hold office so that we can live “quiet and peaceful lives”. The individual Christian is still bound to love the neighbor and be merciful. There are instances in the Bible where God tells his people to do some things that to our ears are horrendous. Whole tribes of enemies are “put on the ban”. One example is the total destruction of the Amalekites. 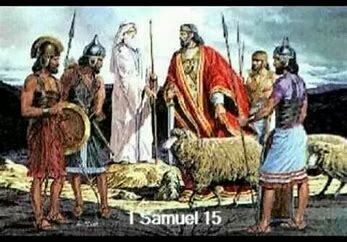 You can read it 1 Samuel 15. Kill everyone and everything was the order, and King Saul spared what he thought was valuable, the sheep and oxen but the people of the Amalekites were destroyed. Yet that was not enough. The utter destruction was instruction not only to would be enemies but to the people. The corruption of these enemies would always seep into the politics and the religion of Israel. So God sought to ban a tribe of enemies that were evil. They were so evil that He wanted nothing of what they were on the face of the earth. Saul in his own wisdom saved someone so vile that he joked about the death of his own people. When he was brought before Saul, Agag the Amalekites was “cheerful” and said surely the bitterness of death is over”. So God sought to ban something and his own chosen King was the instrument of the ban being broken. In the middle of this story the punishment of Saul is disclosed. “For rebellion is as the sin of divination, And insubordination is as iniquity and idolatry. Because you have rejected the word of the LORD, He has also rejected you from being king.”, says Samuel to Saul. Not doing what God says and seeking to do things our own way is like practicing magic.